It may be just a pair of “our” legs in the New York Times, but what a speedy set they are. 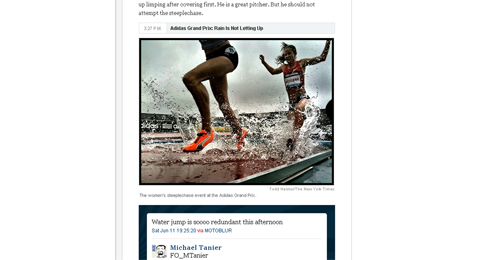 The Times sent out a reporter named Michael Tanier to cover six professional sporting events in the New York area in just twenty-four hours, and the New York Diamond League stop was on his itinerary. The lens of his photographer captured Delilah DiCrescenzo navigating the water jump — and showcasing her Puma footwear for the camera. The race may not have been everything Delilah was hoping for — 9th in 9:50.61 — she still sits as the 7th-seed at the upcoming US Championships, and defeated two higher-seeded women in New York. Meanwhile, across the Atlantic, Lineth Chepkurui won the Kenyan Armed Forces 5000m over Sharon Cherop (third at this year’s Boston Marathon), a win of determination for the star who continues to battle leg pain.